I have a relatively restrictive diet these days, so it is hard for me to justify spending $95 on a brunch. But if I did feel I could take advantage of the offerings, I would certainly try the Sunday brunch at the Waldorf Astoria hotel. I have written of this hotel a number of times before - if you have not been there, I highly recommend a visit. Seeing the public lobby space is a voyage to a time gone by. Staying at this grand dame is not as rarefied an experience as one might expect. It has become the hotel of choice for my family's occasional visits to New York. With Internet discount websites, very good deals can be had on rooms at the Waldorf. In the course of my visits there, I have watched the magnificent spectacle that is the Sunday brunch. 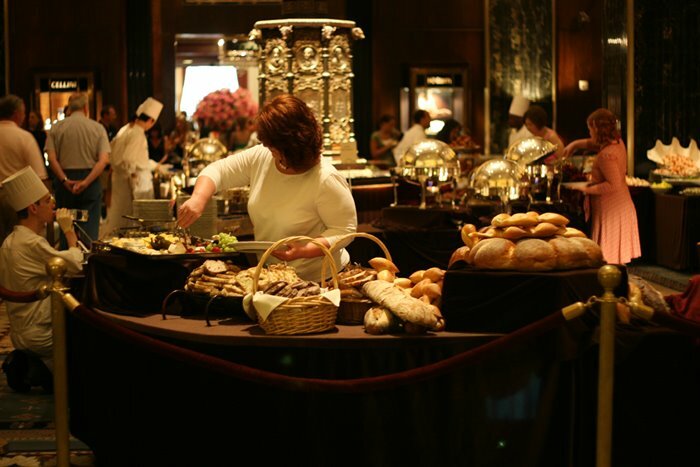 This minor weekly event is served in the Main Lobby of the hotel, so the nonparticipant can easily see the offerings in what has to be one of NYC's finest brunches. Diners are seated in the Peacock Alley restaurant (opened in 1931) and private dining salons. The sumptuous brunch is put together by French chef, Cedric Tovar, who earned his reputation at legendary, Michelin-starred Parisian restaurants like La Tour D’Argent and Plaza Athénée Hotel Paris. I'm impressed that such quality can be maintained in a large, buffet style meal - buffets can very frequently become feeding at the trough - selecting food can feel like picking over someone else's leftovers and quite unappetizing. At a first class offering like this however, you can put any of these concerns aside. The food choices themselves are, of course, spectacular, both in quality and range. Everything imaginable is available. Not to mention that technically, this is a no holds barred, all you can eat affair with no restrictions. I doubt, however, that this brunch attracts the typical all you can eat urban or suburban forager. * For those unfamiliar, Fawlty Towers was a brilliant British sitcom from the 1970s starring John Cleese. Only twelve episodes were made but a lasting legacy remains. In one episode "Waldorf Salad," an American guest is frustrated in his inability to order a Waldorf Salad. Proprieter Basil Fawlty, unfamiliar with the salad or ingredients, feigns knowledge - the skit quickly escalates, with Basil going into an outrageous charade. Highly recommended, as are all the episodes. Related Postings: The Plaza, Waldorf Astoria Clock, Luxury.